In theology, predestination is the doctrine that God has foreordained all things, especially that God has elected certain souls to eternal salvation. In crude simple terms, the concept of predestination is synonymous to the term ‘fixed destiny’. The concept of predestination is a problem with respect to the theological idea of theodicy – the branch of theology that concerns itself with the question: ‘If a superior entity is both omnipotent and “good”, how can evil exist in the world?’ Presuming all events are predestined, all evil must be unavoidable as well. Therefore, the doctrine of predestination makes it virtually impossible to call an omnipotent entity “good”. “People say, “Well, how do you have free will? Do you think you do have it?” Well, it’s a very, very difficult subject indeed. Some religions say you don’t in effect have it, that all is determined by heaven, you’re really only a play thing in a larger game. I take that to be that some of the point of Calvinism. There are some schools of Islam also that say, “It is only as Allah wills.” There’s no will of yours really involved as long as you’re willing to make the prostration and the obedience. So the connection between religion and free will isn’t as simple and easy as some people think it is. This somewhat degrades the freedom and redefines the idea of will and it seems to me also that there’s something degrading in the idea that saying that morality is derived in the same way; that it comes from on high; that we, ourselves, are not good enough; that we don’t have the dignity; we don’t have the self respect; we don’t have the character to know a right action or a right statement when we see it or when we want to perform it. Sleep is a big boost to the human brain, but the time we spend with our eyes closed in the wee hours of the night are not just about relaxation any more. New studies demonstrate the brain’s ability to learn while sleeping – a phenomenon known as hypnopaedia. In 2012, researchers at the Weizmann Institute of Science played a number of tones to study participants as they slept during the night. After playing each tone, the researchers presented an odor to the still-sleeping participants. Some of the tones only had pleasant odors released after them, while other tones only had unpleasant odors released after them. The still-sleeping study participants reacted by either taking in a deeper breath when there was a pleasant smell, or taking a shallow breath if there was an unpleasant smell. Then, as the night went on, the researchers tried just playing the tones for the sleeping study participants, without presenting the odours afterwards. Even though there was no odour, the sleeping participants still sniffed – either shallow breaths if it was after a tone that had previously been linked with the unpleasant smell, or a deeper breath if it was a tone that had been previously linked with a pleasant smell. This held true even after the study participants woke up, too – when they were awake, the researchers played the tones for them. They had the same breathing reactions as when they were sleeping. The researchers said that this sniffing – even when there was nothing to sniff – showed that their brains were processing the link between tone and smell, even when they were sleeping. In other words, the brains managed to pick up rudimentary information while asleep. In a 1997 episode of the American sitcom Friends, ‘The One with the Hypnosis Tape’, Chandler borrows a smoking-cessation audio cassette, to which he listens while he is asleep. The tape tells him that he is “a strong, confident woman who doesn’t need to smoke”. Chandler eventually manages to stop smoking, but also begins to act effeminately. Aberdeen has the largest and busiest civilian heliport in the world, though the world record for helicopter flights during a single day occurred at Silverstone heliport during the 1999 Grand Prix. 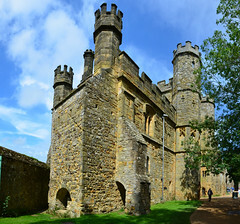 Battle Abbey in Sussex was built by William the Conqueror in 1070 on the site of the Battle of Hastings. The high altar was placed directly over the spot where King Harold was killed. The word ‘abbeys’ appears only once in the whole of Shakespeare. There are 8,597 other words that Shakespeare uses only once. The Aokigahara Forest is the most popular site for suicides in Japan. After the novel Kuroi Jukai was published, in which a young lover commits suicide in the forest, people started taking their own lives there at a rate of 50 to 100 deaths a year. The site holds so many bodies that the Yakuza (Japanese Mafia) pays homeless people to sneak into the forest and rob the corpses. The authorities sweep for bodies only on an annual basis, as the forest sits at the base of Mt. Fuji and is too dense to patrol more frequently. Originally, a heckler was someone in the textile trade who combed out flax or hemp fibres. Its more common meaning began in the early 19th Century when the radical and unionised hecklers working in Dundee used to interrupt the colleague responsible for reading out the day’s news. Hence the word became associated with firing off questions aimed to tease or comb out truths that the speaker might wish to conceal or avoid. A more bawdy version had been practised much earlier, in Elizabethan theatre, where it was very much part of the boisterous atmosphere to shout at actors. An interruptive tradition that is – unfortunately for some – sometimes still practised today. Not that heckling is confined to the theatre, it is a technique that is used in the political and scientific arena as well. In the following anecdote, the American biologist Daniel Dennett reminisces about a debate in which he sat alongside author Christopher Hitchens. Looking back, Dennett now believes sometimes a heckle is called for. “We were both appearing in a debate as part of the program of Ciudad de las Ideas, an excellent gathering held annually in Puebla, Mexico. […] One of the speakers for the other side, the God side, was Rabbi Shmuley Boteach, […] the rabbi launched into a series of outrageous claims trying to besmirch Darwin and evolutionary biology by claiming that Hitler was inspired by Darwin to organize slaughters to ensure the survival of his race. I sat there, dumfounded and appalled, and tried to figure out how best to rebut this obscene misrepresentation when my turn came. Christopher didn’t wait his turn. “Shame! Shame!” he bellowed, interrupting Boteach in mid-sentence. It worked. Boteach backpedaled, insisting he was only quoting somebody who had thus opined at the time. Christopher had broken the spell, and a particularly noxious spell it was. A papal decree prohibiting the administration of the sacraments from a political entity under the power of a single person (e.g. a king or an oligarchy with similar powers). The Landsknechts were German mercenary soldiers who excelled on the battlefields of Europe from approximately 1487 to 1556. Landsknecht literally means ‘servant of the country’. They were originally created as a force to support the Holy Roman Empire, but they soon began hiring themselves out to the highest bidder. 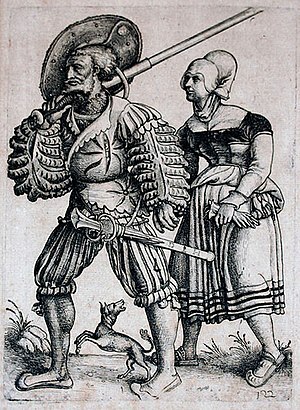 Men who joined a Landsknecht company (known as a Fähnlein) usually brought along a sister, wife, or daughter to care for them. These women were called Hure – which literally means ‘whores’, but they were not quite prostitutes. The women of the landsknechts cared for the men between battles; some even participated in battles, looted the dead or killed the almost-dead. Some of the women even assisted with the heavy artillery, and stripped enemy houses of wood that was used later for earthworks. Despite the assistance, the life of a landsknecht was not easy – punishment for breaking contract was swift and violent, battles were bloody and fierce, and the living conditions were usually very poor and uncomfortable. The primary benefit of landsknecht existence was the pay; a Landsknecht earned more in a month than a farmer earned in a year. If he survived, he could retire wealthy. Everything can, in principle, be explained; everything that is, has a sufficient reason for being and being as it is, and not otherwise. The concept of determinism in the domain of human action is often contrasted with free will. The argument called indeterminism negates deterministic causality as a factor and opposes the deterministic argument. Predeterminism, on the other hand, proposes there is an unbroken chain of prior occurrences stretching back to the origin of the universe.